It's easy for writers to find themselves in ruts. They get known for a particular genre, hit their style or fluke their way into a readership and lose the need to experiment. If there was a verb for this phenomenon it could be: to Grisham. 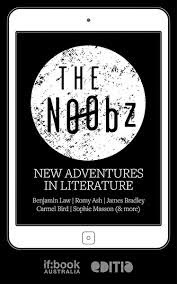 The n00bz: New Adventures in Literature wants to disrupt the writerly rut, the tendency to Grisham, by pushing out of their comfort zone. The challenge was to take-on an experiment with another part of publishing or culture. So we have fictioner and critic James Bradley attempting a comic based on his superhero short story, if:book Australia manager Simon Groth tapping away at retro typewriter and Benjamin Law confessing he has no journalist cred until he can learn old fashioned shorthand. But not just writers are experimenting with former bookseller Greg Field picking up after his bookstore closes and finding a new life online. His Star Wars analogy of modern publishing makes his opinion clear in casting Darth Bezos but the Force is strong in this one and he ends up building an app. Publisher (and former journalist) Charlotte Harper wears out shoe leather in book distribution though she’d rather the web did the walking in her e-publishing venture, Editia (who publish The n00bz). And ultimately some of these experiments fail. But failure has friends. Bradley engages Zoe Sadoerski as his illustrator and builds a great partnership. Carmel Bird tries to make her book Dear Writer a phoenix rising from out-of-print status by e-publishing it. She struggles over two essays in the book ("So you think/thought you're/were going to make an ebook") and in the second concludes she’ll have to engage a partner – epublisher Bronwyn Mehan of Spineless Wonders – and together they end up epublishing Dear Writer Revisited. The opposite of Grishamming is to Lennon/McCartney – collaborating to create work better than the sum of its parts. The escape from the comfort zone comes from being stretched by collaboration, from appreciating what someone else brings to the equation. "Yes, we type at our keyboards as individuals. But our writing has meaning in a particular context which we can and should shape together. And by doing so, by seeing ourselves as part of a community, we can transform our own relationship with our work." As a book The n00bz is very dippable – short, chatty essays following uneasy journeys in new creative processes. The experimenters brave enjoy being their own lab rats coming out with new takes on the world. Beyond this book there’s the fires that these experiments spark, where they take writers and readers next. One small note is that this is best as an ebook - providing links to experiments that if you're reading on a device are a single tap rather than several keyboard klutzings to type out a Google link shrink. Fortunately for readers, the writers encourage more risks, failure and experimentation around the #theNoobz which may make the next edition. Helpful review, thanks George. I will have a look at this. And just wanted to say the blog is looking very smart.